...that Tartarus' juvenile name was Tartar? ...that The Ark was making a replacement for Installation 04? ...that keeps are Sangheili familial residences and assembly houses? ...that the Mongoose does not appear in the RTS game, Halo Wars? ...that Halo 3's Marine portrayed by voice-actor Adam Baldwin makes homage to his role on Firefly? Liwitoni Station is a MagLev Train station in New Mombasa's Sector B, under the jurisdiction of the New Mombasa Transit Authority. It is designated as Station 7, and it is noted that the trains from this station do not go to Station 8, but rather to Station 11, somewhere else on Mombasa Island. One point of access is through a reinforced emergency door from Sector B - this leads to the parking facilities; another point of access is through a tambour door adjacent to the main station entrance. Liwitoni Station has eight ticket booths and three phones, as well as five of what appear to be closed circuit televisions. 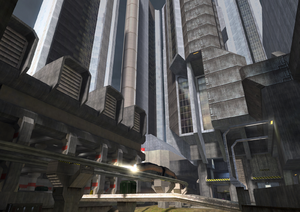 The Halo 2 multiplayer map Terminal, part of the Maptacular Pack, is set in Liwitoni Station. In 2552, the station, along with every other MagLev station in that area, was closed when the Covenant invaded during the Battle of Earth. The maglev rail system was one of the Covenant's first targets during the Battle of Earth. The logo of the station. The Terminal's automatic PA announcements are spoken in both English and Swahili. The Monitors at the station are all tuned to Channel 7. This is another one of Bungie's 7 references. An advertisement for Havadi Goodwan can be found on one of the Terminal's walls. It's the only ad found in the station. In modern-day Mombasa, there is a district called "Liwatoni". This location is fully submerged by the 26th century, located some hundreds of meters WNW of Uplift Nature Reserve. Evidently, the district has been redesignated since the 21st century; this is the case with many other districts in the city as well, due to the fact that the coastlines and structure of the city have changed so dramatically. An obsolete Map of the New Mombasa's Transit Authority routes with an arrow pointing to where Liwitoni Station would be.